VR3SW is coupled with a micro switch with cam principle such that change in resisitance comes only after operating of micro switch. 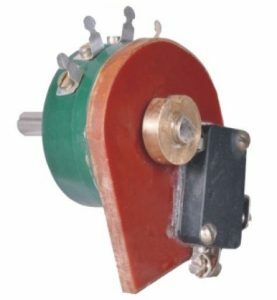 This is advantageous in critical condition where power to the potentiometer can be permanently disconnected using NC NO micro switch. V.R-3SW has been specifically designed to have longer life, No discontinuity and smooth movement of shaft along with a additional feature to completely isolate the system from voltage entering the system. 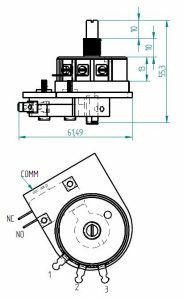 The capability of the company to produce a vast range of ohmic value in potentiometer is a USP on its own. For best performance of V.R-3SW below points needs to be taken into consideration. 2) V.R-3SW should be mounted with Star washer given along with the product and perpendicularity between the panel and axis of potentiometer should be maintained. V.R-3SW - Resistance Value - Shaft length - Any specific Info.